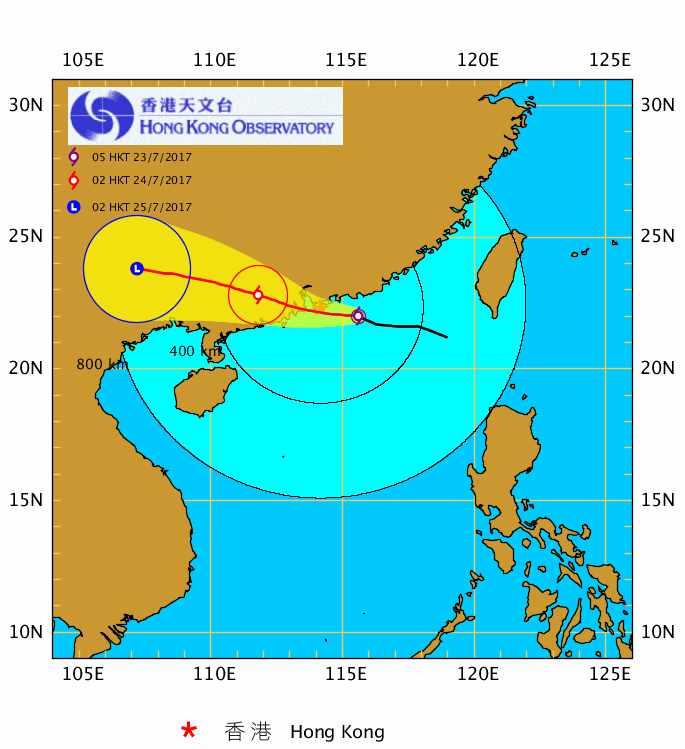 *The information about this storm from JTWC is incomplete and is thus replaced by that from the HKO. A patch of convections developed near the Luzon Strait early on July 21. The JTWC issued a tropical cyclone formation alert to this system at 8 am that day, and upgraded the system into tropical depression 10W at 2 am the next day. 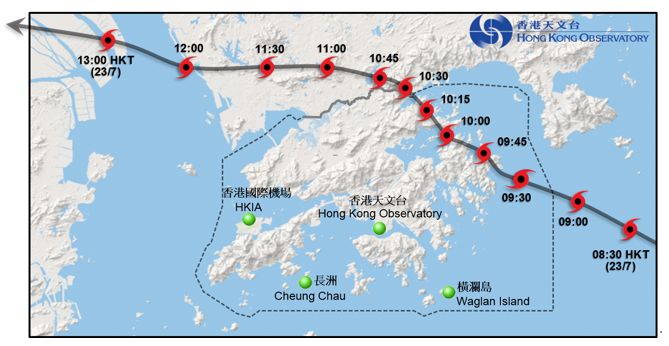 10W was moving west-northwest along the southern periphery of a subtropical ridge anchored near Shanghai, and was expected to make a close approach to Hong Kong during the weekend. 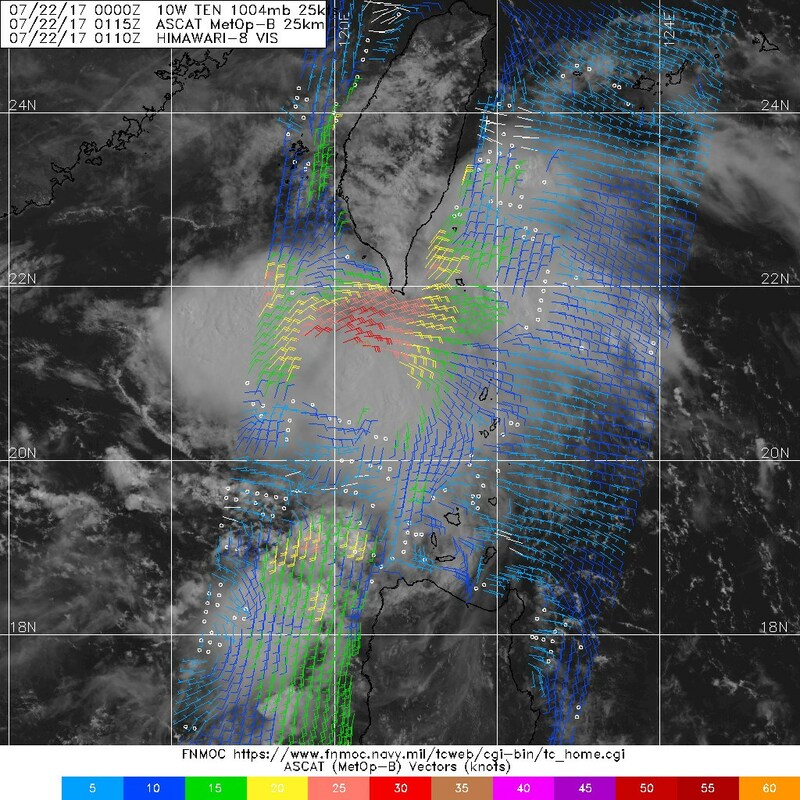 The convections associated with 10W expanded during the day of July 22 and its spiraling characteristics improved. Without first issuing a gale warning, the JMA upgraded 10W directly into a tropical storm at 2 pm and named it ROKE. This also prompted the HKO to upgrade the system into a tropical depression shortly after. 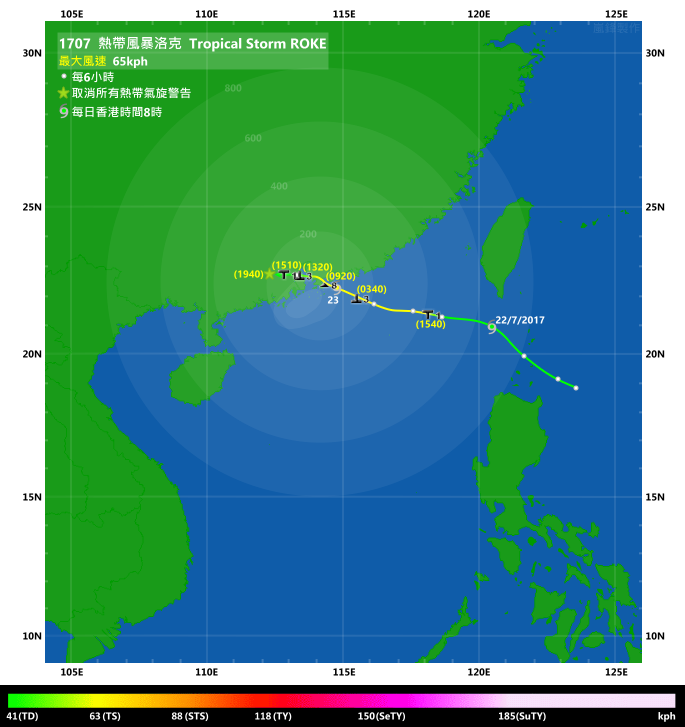 ROKE moved west-northwest steadily during the night of July 22 and morning of July 23. 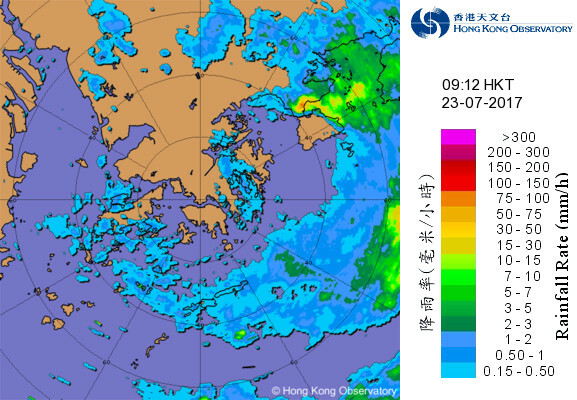 The HKO upgraded ROKE into a tropical storm at 2 am July 23. 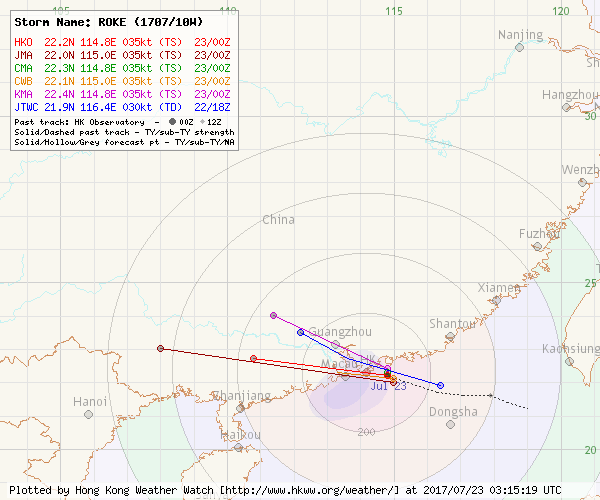 ROKE made landfall near Sai Kung East Country Park at around 10 am, becoming the first tropical cyclone to make landfall at Hong Kong since Typhoon NURI in 2008. 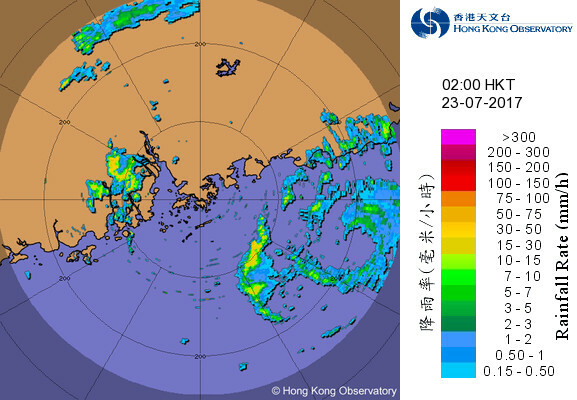 After landfall, ROKE deflected north towards the Hong Kong-Shenzhen border. The storm crossed the Pearl River Estuary near noon and continued its way across southern Guangdong. 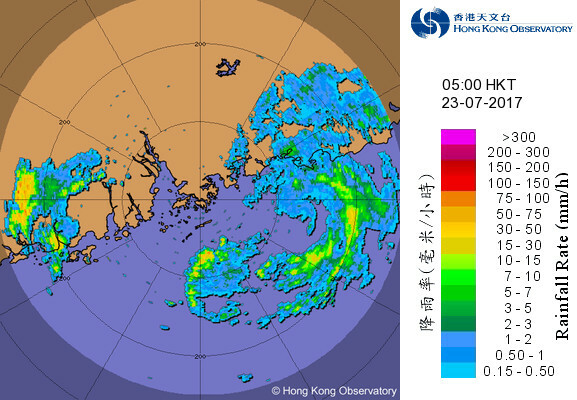 As a small and weak system, ROKE disintegrated quickly after landfall. 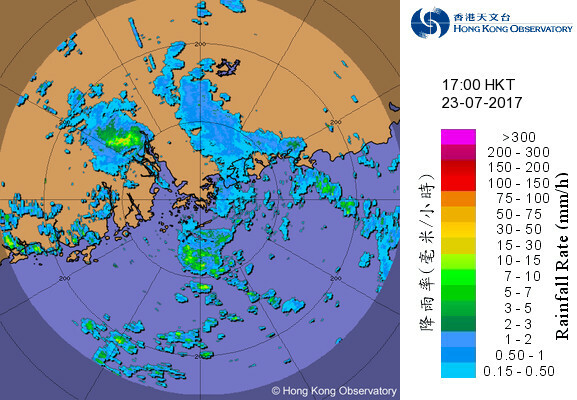 The HKO downgraded ROKE into a tropical depression at 2 pm and further into an area of low pressure near 8 pm the same day. 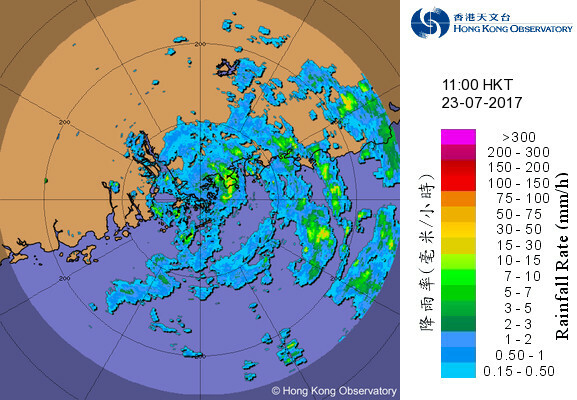 The HKO issued the #1 Standby Signal at 3:40 pm July 22, or shortly after upgrading ROKE into a tropical depression. The initial forecast track had ROKE making landfall close to, but still east of Hong Kong. 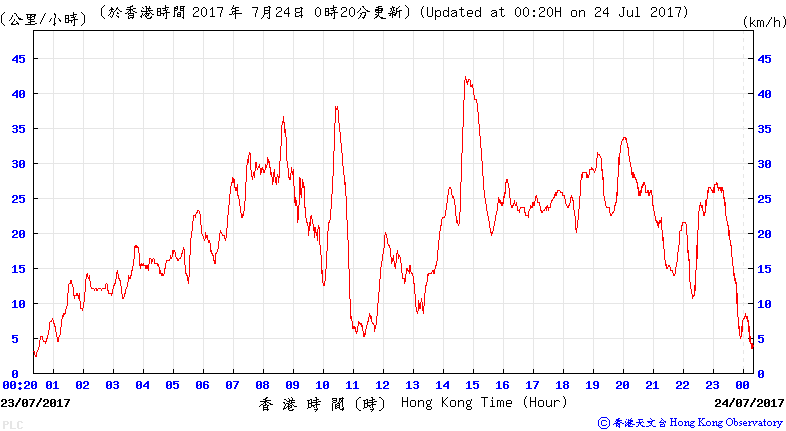 The HKO indicated that higher signals were not likely that night. Locally, the weather was generally fine on July 22. 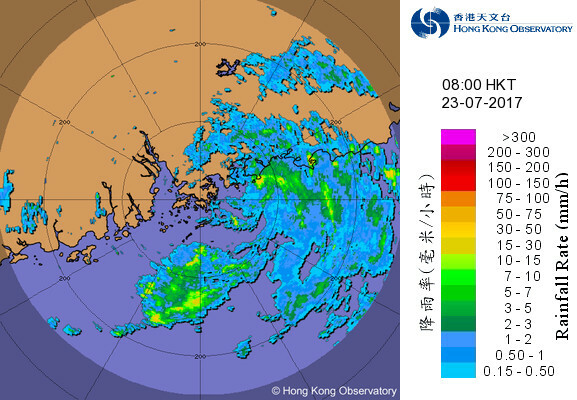 Later that night, as ROKE was steadily approaching the territory, the HKO mentioned that the #3 Signal would be considered before 6 am July 23. 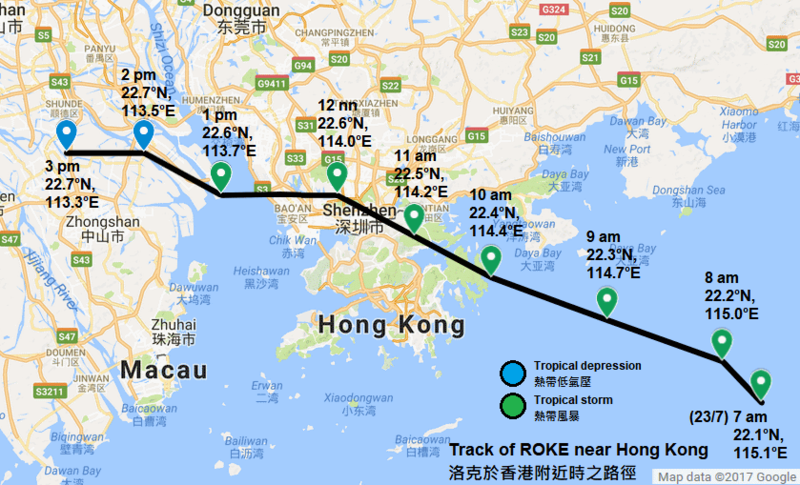 From information gathered from buoys and ships in the South China Sea, the HKO determined that ROKE had reached tropical storm strength and made the upgrade at 2 pm. The handling of empty cargoes was also suspended at about the same time. 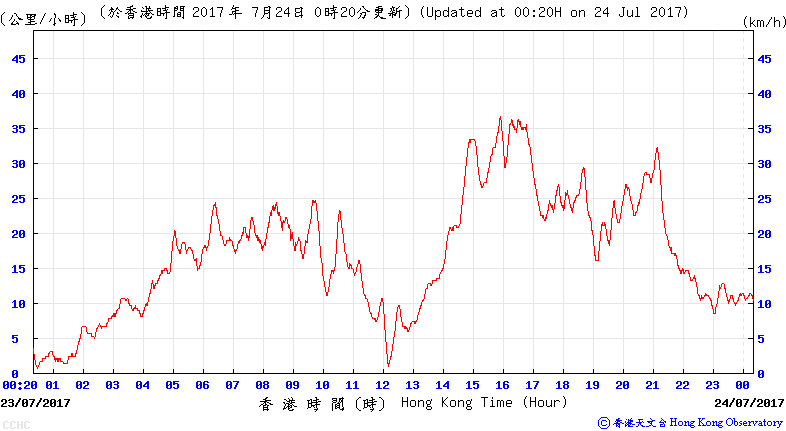 Because ROKE was expected to be very close to Hong Kong in the morning, the HKO issued the #3 Strong Wind Signal at 3:40, when ROKE was around 170 km east-southeast of the territory. Winds were mostly blowing in from the north, but the wind speeds were not much different from a normal day. 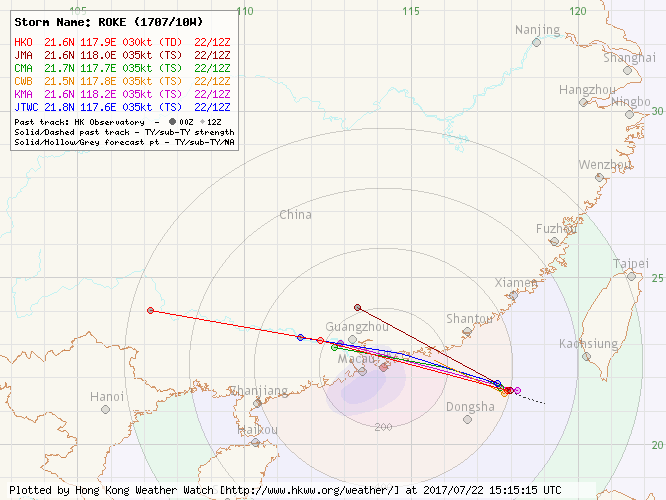 ROKE moved west briefly during the night and the HKO's forecast track in the small hours had ROKE passing south of or through Hong Kong. 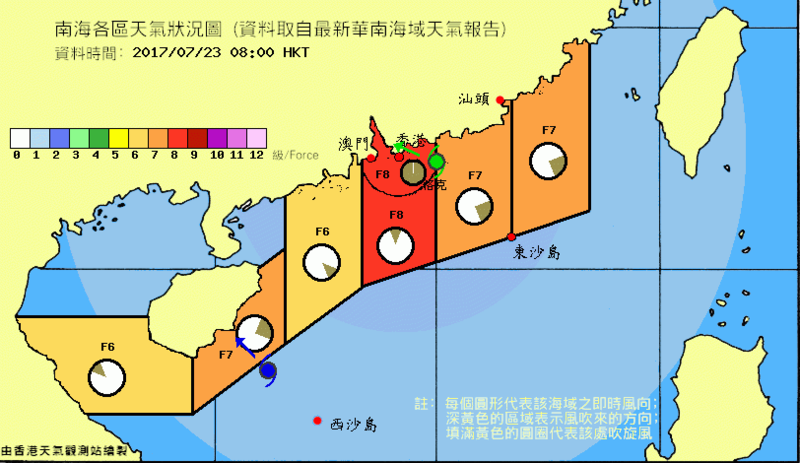 At 7 am, the HKO indicated that due to ROKE's anticipated close approach, the wind direction would change from the north to south quickly; members of the public were reminded to stay alert. The Pre-No. 8 Special Announcement was issued at 7:20 am, warning that the #8 Signal would be issued within the next 2 hours. The #8 Northwest Gale or Storm Signal was eventually issued at 9:20 am, when ROKE was located around 60 km east of the Observatory. 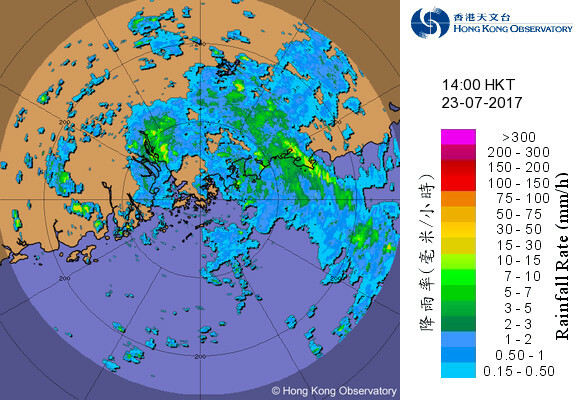 ROKE's rainbands started to affect Hong Kong near 9 am; however, as most of the storm's convections were concentrated in its eastern side, the rainfall intensity was rather weak. 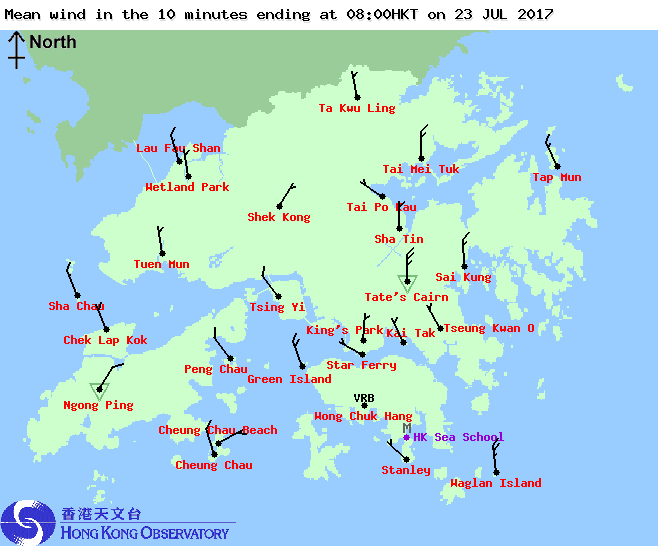 Winds at many places also picked up, but they were still generally below strong force level except at several offshore or elevated areas such as Waglan Island, Green Island, Tap Mun and Tate's Cairn. Due to the #8 signal, public transport services were gradually suspended. 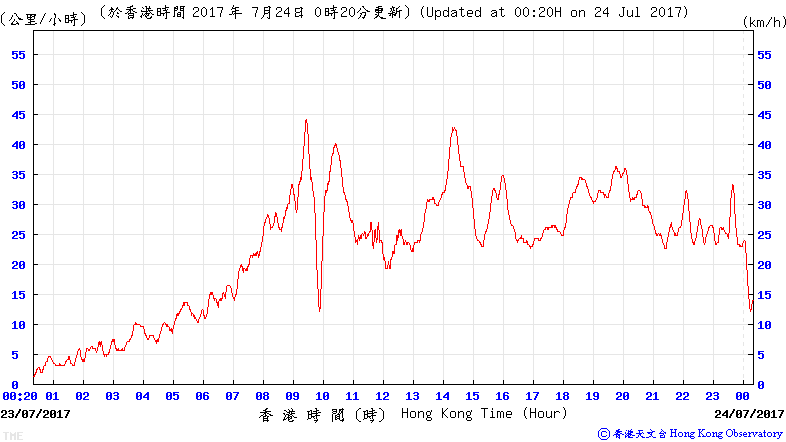 The Hong Kong Book Fair and various sports activities scheduled for that afternoon were also affected. 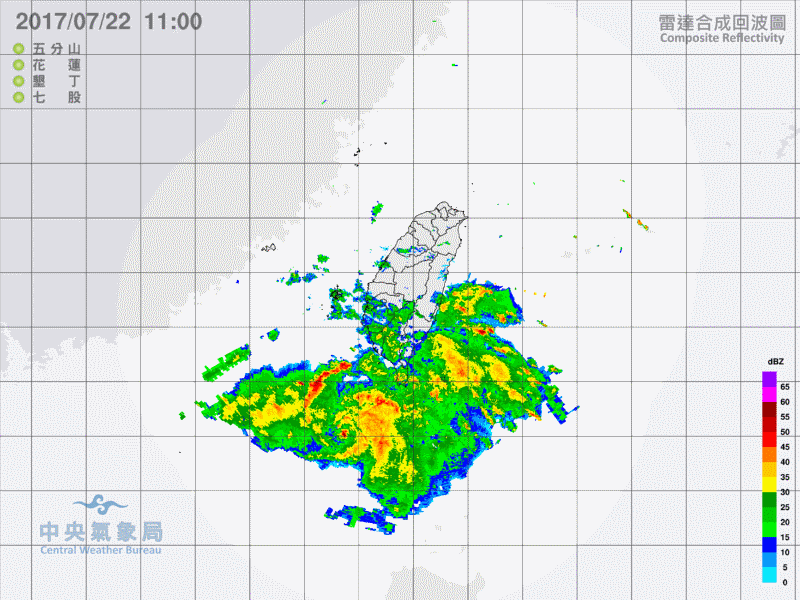 According to the HKO, ROKE made landfall at the Sai Kung East Country Park near 10 am. The storm moved northwest briefly afterwards, entering Shenzhen an hour later and passed 20-30 km to the north of the Observatory. From the publicly available data, the best piece of evidence of ROKE's landfall at Hong Kong is perhaps the change in wind direction at Tap Mun --- it is the only station where winds veered from the northwest to southeast near 10 am; all other stations experienced a backing in the wind direction. 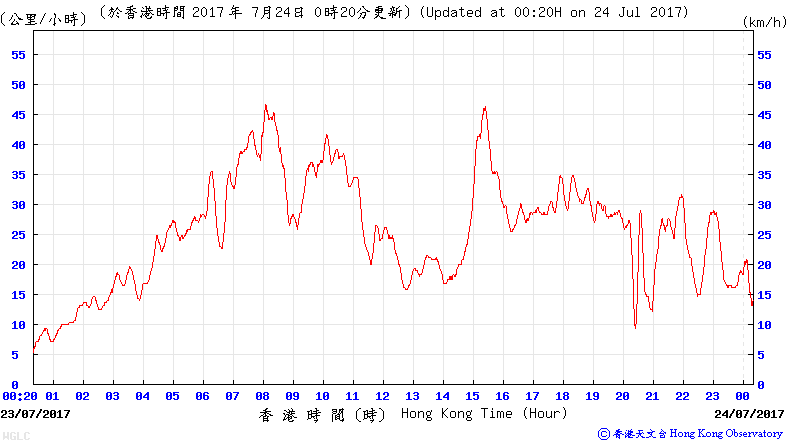 However, most of Hong Kong avoided ROKE's windiest part and, as a result, none of the anemometers within the territory registered gale force winds during its approach. Even strong winds were not observed generally and none of the eight reference station reached the strong wind threshold. Following its approach, ROKE crossed the Pearl River Estuary and moved towards Zhongshan and adjacent areas. Winds in Hong Kong backed to the south or southeast near noon, and started to subside in the late afternoon. The #3 Strong Wind Signal was issued to replace the #8 Signal at 1:20 pm, and was replaced by the #1 Standby Signal at 3:10 pm. Various services, exhibitions and events were resumed in the afternoon. 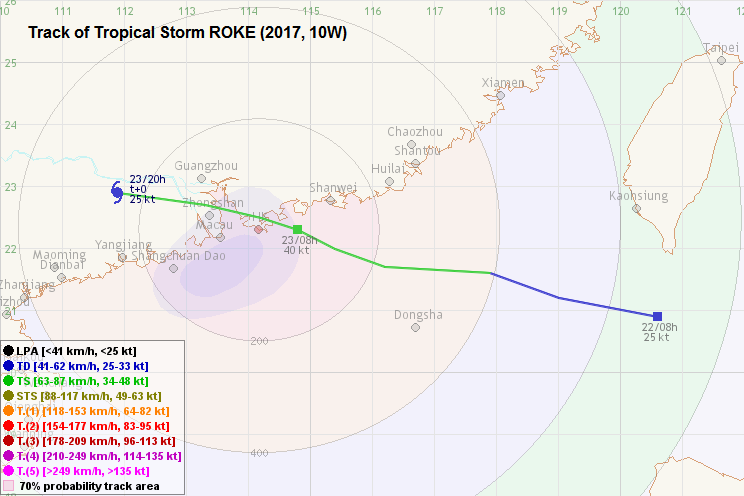 ROKE weakened into an area of low pressure around 200 km from Hong Kong soon after sunset; the #1 Signal was therefore lifted at 7:40 pm. The weather remained unstable that night as a rainband swept across the territory. The Amber Rainstorm Warning was issued at 10:30 pm that night and remained in force for more than 2 hours. Figure 1 - Satellite image of ROKE at formation, together with a wind field analysis which depicted the presence of strong force winds. 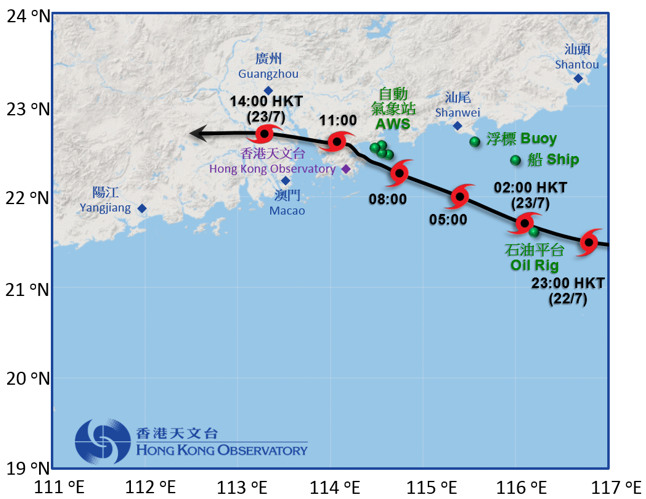 Figure 4 - HKO's forecast tracks at 2 pm July 22 (left) and 2 am July 23 (right); a passage south of Hong Kong was predicted in the latter plot. Figure 6 - Weather observations from ships and various weather stations around the South China Sea early on July 23. 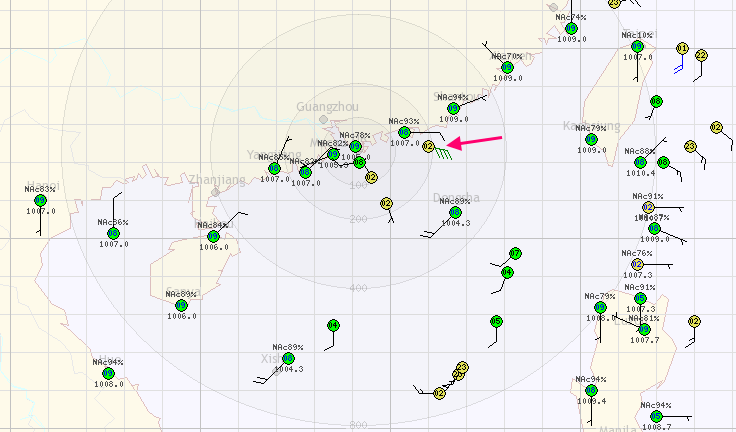 Note in particular the ship near 22.4°N, 116.0°E (indicated by the red arrow) which reported gale force easterly winds (42 knots, 78 km/h) at 2 am that day. 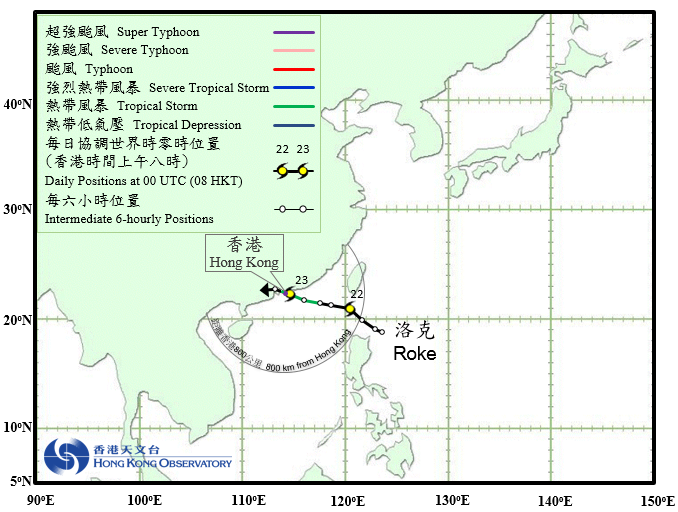 Figure 7 - Weather conditions in the South China Sea as ROKE closed in on Hong Kong. 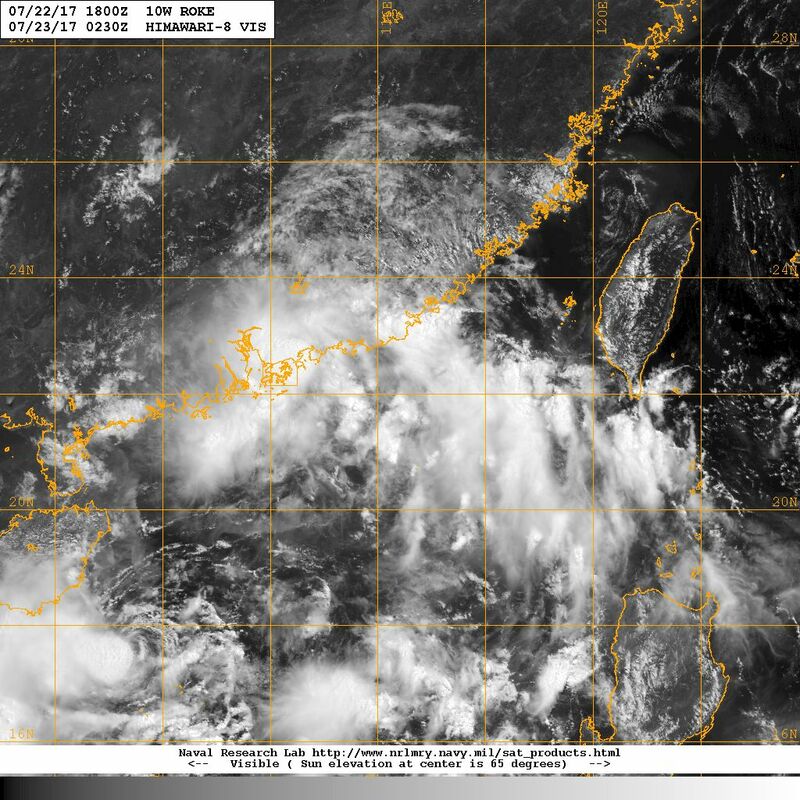 The tropical depression near Hainan Island would later develop into tropical storm SONCA. Figure 9 - Animation of the evolution in wind speeds/directions at various places in Hong Kong between 7 am and 1 pm July 23. 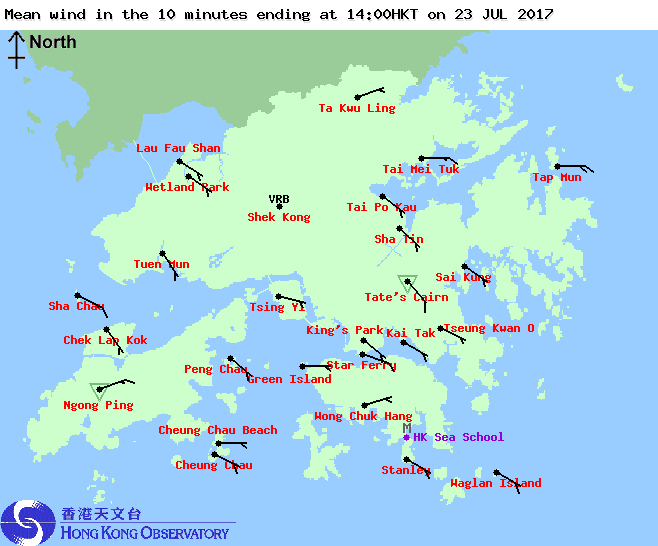 Note in particular the veering wind at Tap Mun, from northwest to southeast. 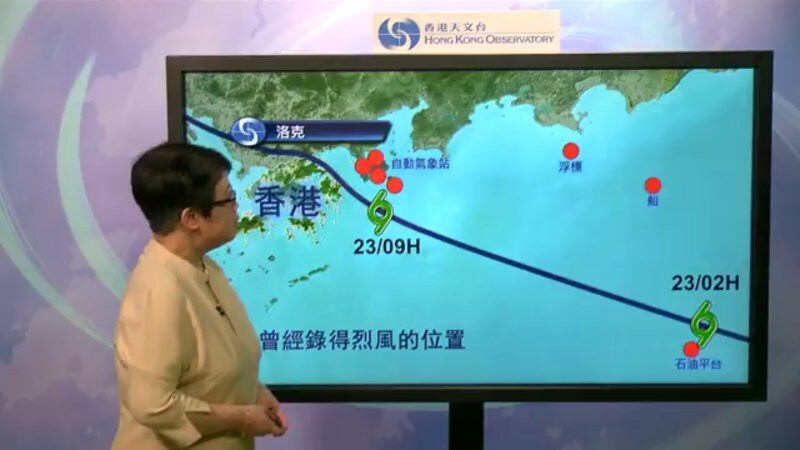 Figure 16 - Ms. Lee Shuk-ming, Senior Scientific Officer at the HKO, explained the necessity of issuing the #8 Signal as gales were recorded at various places near ROKE's path. Click here for the video of the press briefing.